It is not just primary schools where the Gujarat government appears to be seeking to introduce dress code for teachers. Posters put up by the Gujarat police in Porbandar, Mahatma Gandhi’s birthplace, have said that women should be “appropriately dressed” while coming out of their residence. 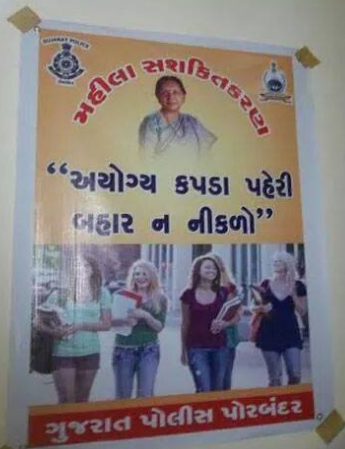 The posters carry a photograph of Gujarat chief minister Anandiben Patel at the top, in sari, advocating “women’s empowerment”, and down below is shown college girls from a foreign university in “inappropriate dress” – T-shifts and jeans. 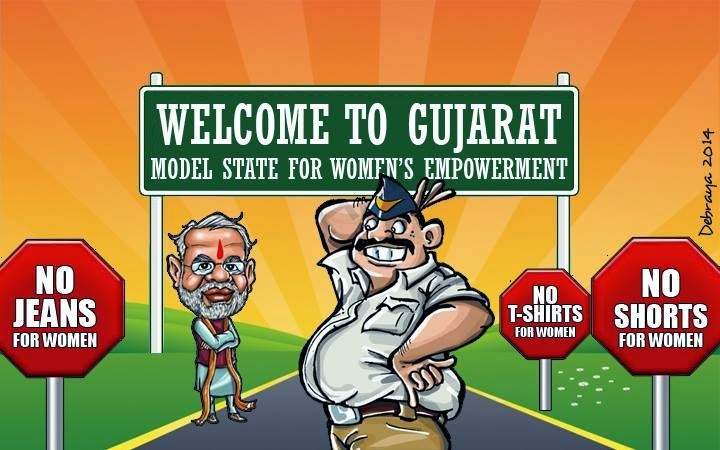 As part of the women’s empowerment week of the Gujarat government, the state officials have long been toying with the idea of having “appropriate” dress code for women. While opponents of the Gujarat government call such a move as an effort to implement the “RSS fatva”, and social media carries comments ranging from “Hindu Taliban” to the suggestion as to why is there is discrimination between men and women, the move comes several weeks after the state education department suggested a dress code for teachers in schools. In mid-July this year, a five-member committee, appointed by Gujarat education minister Bhupendrasinh Chudasama, stressed on a dress code for lady teachers, saying they should wear sari or shalwar-kameez while in school. It also recommended a banned wearing T-shirts and jeans. The recommendation reportedly came following a meeting of the municipal school board chairman, district panchayat chiefs, district education officers and district primary education officers at the Gujarat Council of Educational Research and Training, Gandhinagar. Presided over by state education minister Bhuprendrasinh Chudasama, the committee recommended that the salary of teachers who do not wear “appropriate” dress would be deduced. Justifying the dress code, Jagdish Bhavsar, head of the committee, has reportedly justified the dress code saying that here at stake is the “most impressionable age group," and if “good values can't be imparted at this age then what will happen". Local efforts to impose dress code on women began in 2012. The Junagarh District Primary Education Office issued a circular on November 26, 2012 addressed to District Development Officer stating that to their knowledge they have learnt that the primary school teachers were wearing “other attire than the saris while attending the school”, and they should be stopped from doing so starting with December 2, 2012. Around the same time, according to the primary school teachers’ association, the Dahod district education office came up with the idea that there should be a dress code for both male and female teachers – while male teachers should come with white pants and shifts, female teachers should come in white saris. It is quite another thing that this kind of dress code has proved to difficult to implement.